Oh my word! This stuff is good. It looks so simple that my nephew thought it was just yogurt and bananas, but you take a bite and your world changes. Life before having this delicious concoction was just so dull, and things can’t go back to the way they were. You need this is your life. And fyi, this is pretty close to the Magnolia Bakery version. Theres no cooking involved. Just some mixing here and there and some chilling in the fridge and there you have it. Start off by whisking together the pudding mixing water. Whisk for two minutes then drizzle in the condensed milk and whisk. Once it’s smooth cover it and let it chill in the fridge for at least 1 hour(you might need to let it chill for 2 hours). In a large bowl whisk the cream until soft peaks form. Then just fold the cream into the pudding mix in three stages. Make sure you fold the cream in. If you whisk it in it might deflate the cream. 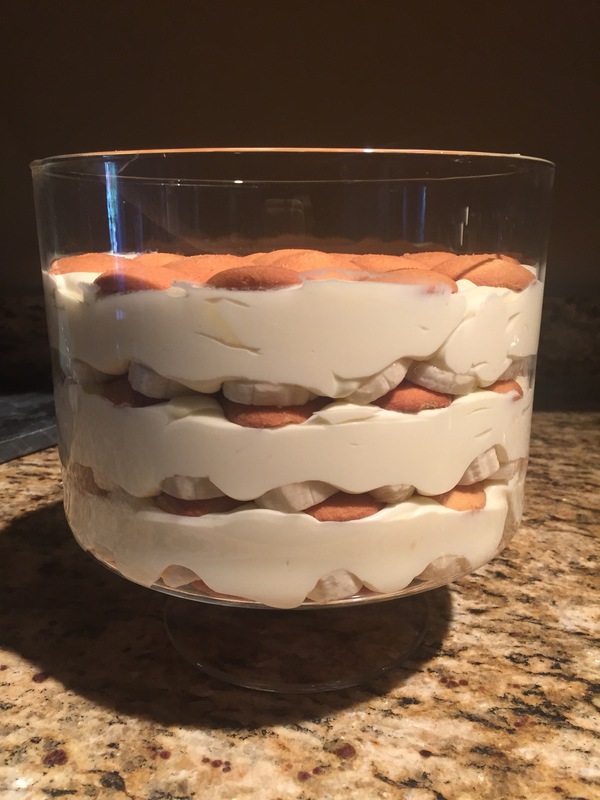 Then it’s a matter of getting a trifle dish or any pyrex dish and starting with a layer of wafers, then bananas, then the pudding and cream mixture. For my trifle dish I like doing three layers so I divide everything into three, but you could do two layers in a rectangular pyrex dish as well. Then chill for a few hours before serving, or you can keep it in the fridge overnight. It’s a great make ahead dessert and can feed approximately 10-12 people, maybe even stretch it to 15.